This tuning raises the 12-string Classic tuning on our long-scale instrument up by a 5th interval on both sets of strings, for the highest possible melody group of 4ths, and a broad-ranging accompaniment group of inverted 5ths. The melody strings cover the lead guitar and violin range, and the accompaniment group covers the rhythm guitar and high bass range. 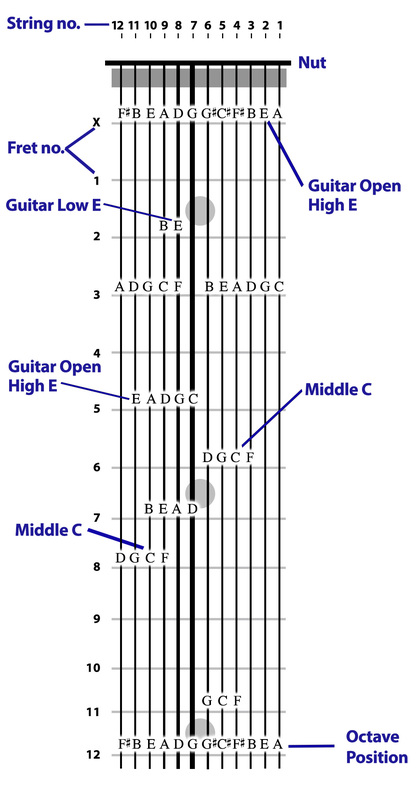 The overall range is from G, a major 6th below guitar low E, to F#, a whole step above the highest E on a 24-fret guitar. Changing the highest interval of the accompaniment group from a 5th to a 4th adds some colorful chordal voicings, power chords, and a mirrored 4ths counterpoint capability on the two highest bass strings. It also places the entire range of the guitar's open strings within strings 8-12, allowing the left hand to play a wide variety of guitar range chords and voicings. Copyright © 2016 Stick Enterprises, Inc.